A credit union, like USALLIANCE, is a non-profit, membership-based, full-service financial organization. 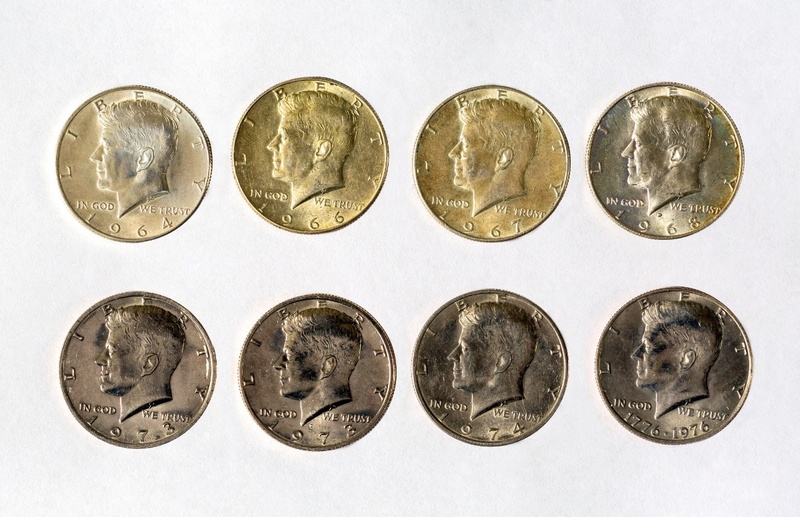 After expenses and reserves are set aside, profits are distributed back to members. These come in the form of higher returns and lower rates and fees, as well as free or low-cost services. A bank is a business that earns a profit for shareholders through high rates and fees charged to customers. Credit unions exist to meet the needs of their members, who are owners of the organization. Instead of opening an account, individuals become members and their deposits are treated like shares in the business. It’s like a cooperative. Shareholders own banks. They buy stock in the bank and expect make a profit on their investment through the fees and rates customers pay. 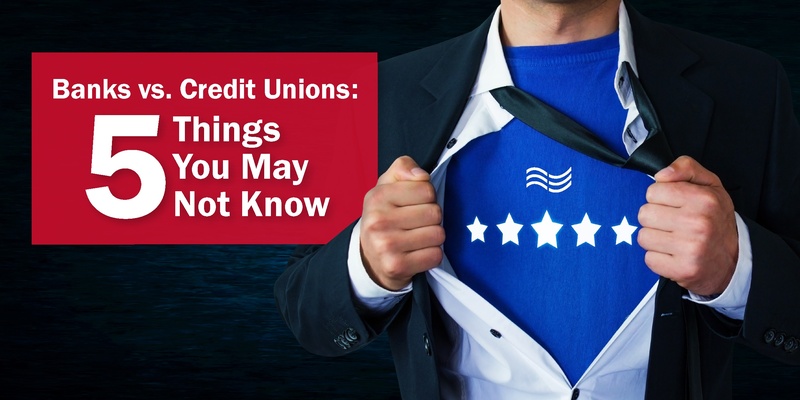 Credit unions are insured by the National Credit Union Administration (NCUA) up to $250,000. It’s an independent federal agency that keeps your money safe. 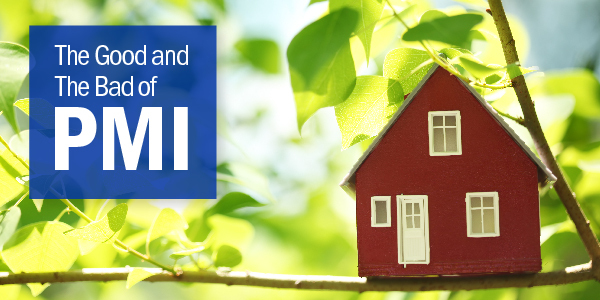 Banks are insured by the Federal Deposit Insurance Corporation (FDIC) up to $250,000. It’s also an independent federal agency that keeps your money safe. Because credit unions exist to serve their members, members elect a volunteer board of directors. This way, everyone has a say in the management as well as the future of the credit union. Like most other businesses, the bank’s shareholders elect a paid board of directors. Credit union membership is restricted to those who share a common bond such as employment, education, or location. 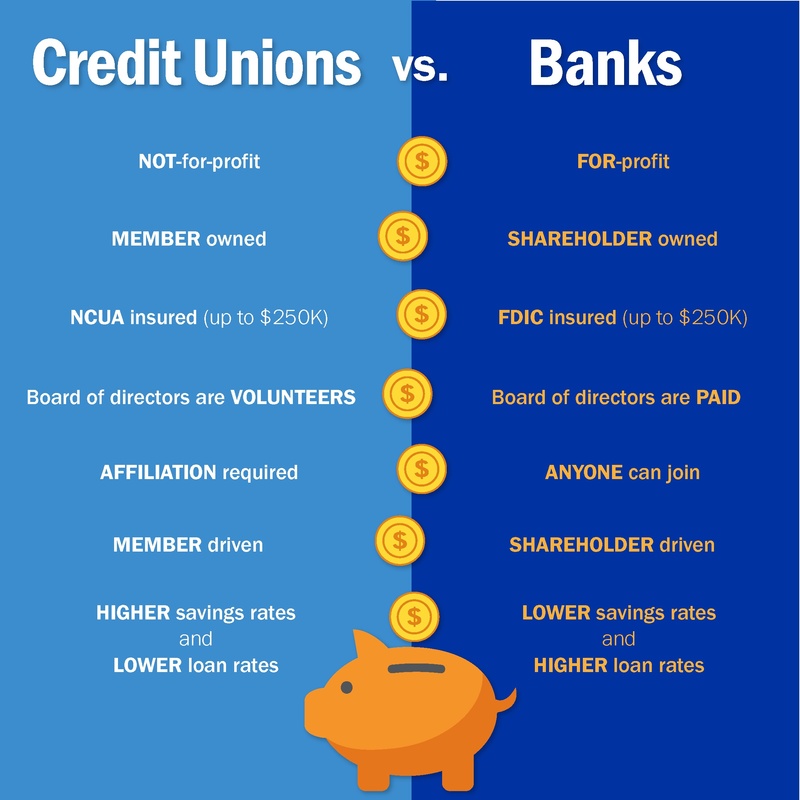 Credit unions tend to be community-based, which furthers their function as a cooperative. They are usually small and local for these reasons. Anyone can open an account at a bank. They are viewed as customers and don’t need affiliation or membership. When it comes to being a shareholder, anyone can invest—shareholders don’t need to have an affiliation or even an account with the bank. As localized non-profits with a member-elected volunteer board of directors, credit unions are truly member driven. Members make sure their specific needs are heard and met by the services and products offered. Bank shareholders and paid directors hold the power when it comes to determining the future of the bank. Big profit, rather than customers’ best interests tend to come first because customers don’t have a say in the operation. Banks tend to have higher loan rates as well as higher and more fees than credit unions because shareholders need to make a profit. However, banks offer a greater variety products and than a credit union because of their size and financial backing. This comes with a sacrifice in customer service. However, banks tend to offer more innovative technology and tools to their customers and can adopt them faster. The reasoning is that offering more attractive products and services will bring in more business, and therefore, increase profit. While smaller size means better service, credit unions have their drawbacks when it comes to reach. They tend to have fewer branches and ATMs, and don’t have convenient locations when members travel outside the region they serve. Branch and service hours are also less extensive than what banks usually offer. However, to compete with larger scale financial institutions, many credit unions have joined ATM and brand-sharing networks to make up for their limited scale. Banks usually have a greater reach and can offer more locations and ATMs. Large banks can be found in many places, making it convenient for customers to travel. Access to bank services is usually greater in terms of hours of locations, including evenings and weekends, as well as hours of customer support. 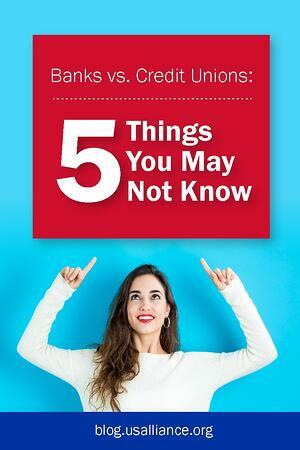 When it comes to choosing where to manage your money, the choice between a credit union and bank is up to you. Each institution comes with its pros and cons, and only you see where your needs are best met and values best align. Here at USALLIANCE, we pride ourselves on being a credit union our members love. We have better rates, fewer fees, the same deposit insurance coverage, and superior service. To learn more about who we are as an organization and what products we can offer you, please click the link below.